Moms need their craft time, too! The drawing above is one I did using a compass, Shamrock Template and a round earring that was on the table beside me to draw the scallops. I colored it with watercolor pencils and markers. The designs are called Zentangle patterns. Zentagle-inspired art has been an obsession of mine for a while now! 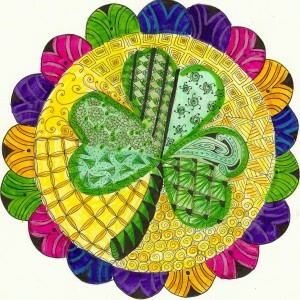 You can learn more about this fun and meditative art form at Zentangle.com. This is fun to do with your kids. Kids adore creating patterns. At TanglePatterns.com you will find enough patterns to keep you and your kids happy for months! 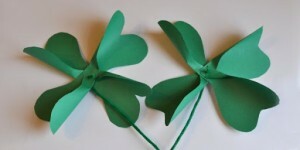 Here’s a round-up of other shamrock kids crafts I found online. Remember that I love to make crafts with what I have around the house and I especially love using recycled materials, scraps, magazines or other leftovers. All of these ideas are adorable but I promise, if you give your child a shamrock template and some construction paper, scissors and crayons, you will be amazed by their creativity. It’s sometimes nice to NOT follow a plan and just enjoy being creative! I stumbled across a great website called ChildMadeTutorials.com and loved this cute card idea. I even have a heart punch still sitting on my desk from our Valentine’s crafts! And of course, lots of magazines. 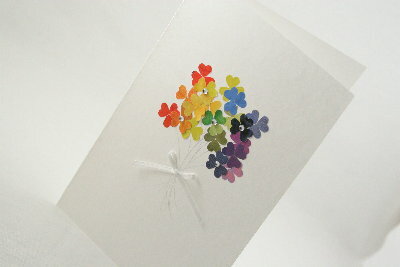 Make a bouquet of clovers from heart punches, glue to the card, add a few stems, bling and ribbon and voila! So simple and so colorful, I love the rainbow effect! 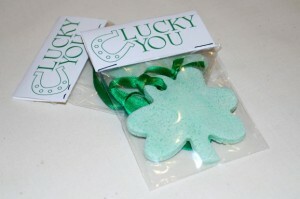 She had several other adorable Shamrock card ideas as well! We will definitely be making this bouquet of paper shamrocks, in fact I printed out several Shamrock templates yesterday. I have so much leftover scrapbook paper! I might be out of skewers, but I have lots of straws which would be a simple substitute. 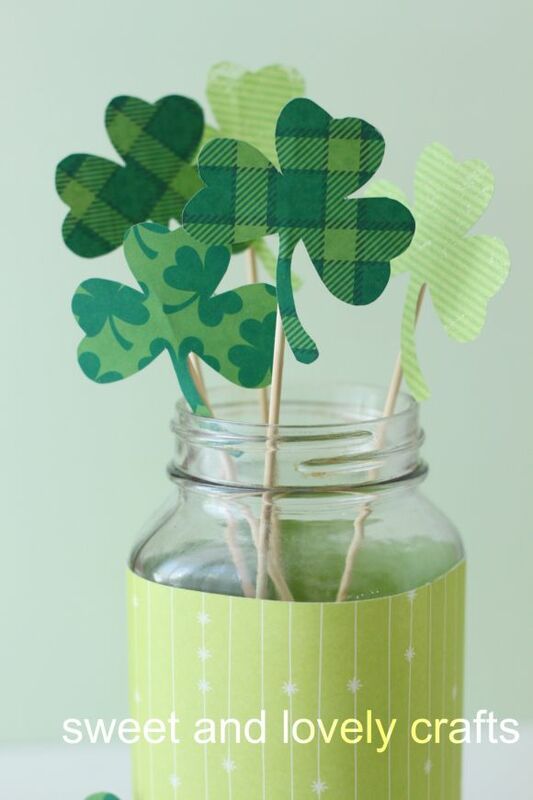 Dollar Store crafts had a huge round-up of St. Patrick’s Day crafts, be sure to check it out here. Here’s a link to a great template that has a variety of different sized shamrocks on it. These Shamrock Necklaces are adorable but the best part was Paging Supermom’s story about crafting with her son, perhaps because I so identified with her! Not only did they have fun making the necklaces, but playing with the extra flour. Kids never cease to amaze me with what they find entertaining. I also loved the packaging idea. What a cute gift for a teacher! Who doesn’t love pinwheels? This simple and super fun Shamrock Pinwheel Craft will be a big hit with your little ones and big ones alike! 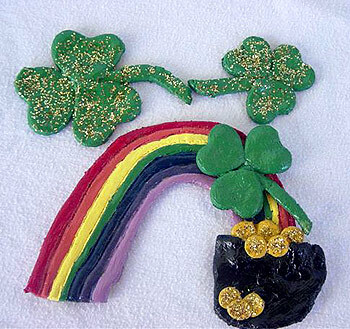 A couple of years ago, Maggie and I made these Salt Dough Shamrocks for North Texas Kids magazine and had so much fun creating, painting and of course, adding lots of glitter! So I thought it was worth mentioning this charming craft again. Maggie especially liked making the Pot of Gold at the end!